I admit it, Active Park Assist was the one feature of the Ford Escape that made me nervous. 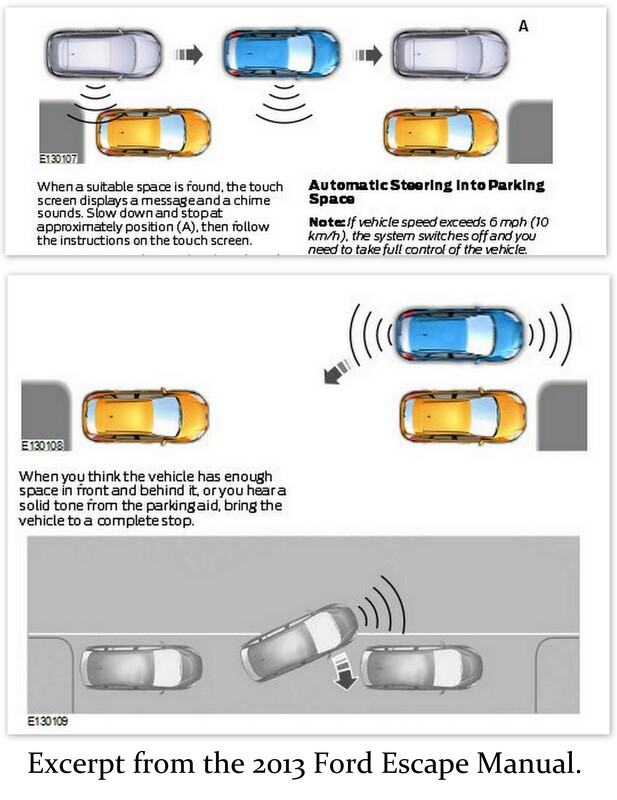 You give over control of the car to a computer which is using sensors to determine distance, angle and rotation. Then letting it make all the decisions to delicately placing your vehicle between 2 other people’s vehicle. Now I’m not saying computers can’t do that better than most people, I’m not even saying they can’t do it better than me. (Though I do parallel park like a boss!) I am saying I wasn’t going to try this blind without someone there to show me exactly what to do. There are 3 expensive vehicles involved in this process after all and I’m supposed to, required to, take my hands off the wheel so the car itself can squeezing my high-priced toy between one guy’s ego and another guy’s source of income, without doing damage to any of them. That is a financial risk I’m not entirely comfortable testing without guidance. And while I love this video, I didn’t count it as sufficient “guidance”. So I got a hands on demo before I left Toronto. We found 2 cars on a quiet street, aligned the Escape, and I pushed the button. I drove past the spot, watching and listening for traffic, pedestrians, pets, and “my surroundings” as the monitor suggests. Until the system told me to stop. I put the car in reverse and took my hands off the wheel. The steering wheel took on a life of it’s own spinning wildly to the right as I felt the car starting to backup. Then the wheel spun spin wildly to the left, and I watched the monitor as the car behind me got closer. Then a big green bar was superimposed on the screen. We moved closer and a big yellow bar appeared. Holy Crap what just happened?!? Now, I love playing with technology and I did grew up with heavy duty “get back on the horse” doctrine. (We had ponies and I had to get back ON them, literally.) So the very next opportunity I had to parallel park, I was damned well going to show this Active Park Assist that I could drive it! Or more accurately that it could park me! So when I found a spot on the narrow and quiet streets of Quebec City I was going for it. And go for it I did! Just wait until you hear how I did in Montreal, after a snow storm, at night, on a busy street with folks trying to weasel into the spot from behind me. PERFECTLY thank you very much!